Kansas House approves Medicaid expansion, but the fight isn’t over yet – Welcome to Wyandotte Daily! A coalition of Democrats and moderate Republicans powered past objections from conservative leaders in the Kansas House Wednesday to approve Democratic Gov. Laura Kelly’s Medicaid expansion proposal. Albeit a slightly revised version. During a debate that stretched from midday into the evening, the coalition prevailed in a rules fight and fought off several amendments aimed at making the bill more palatable to conservatives before voting 70-54 to advance it to a final vote on Thursday. “We’ve discussed this for five years, we absolutely cannot let this chance slip through our fingers,” said Rep. Kathy Wolfe Moore, D-36th Dist., from Kansas City, Kansas. 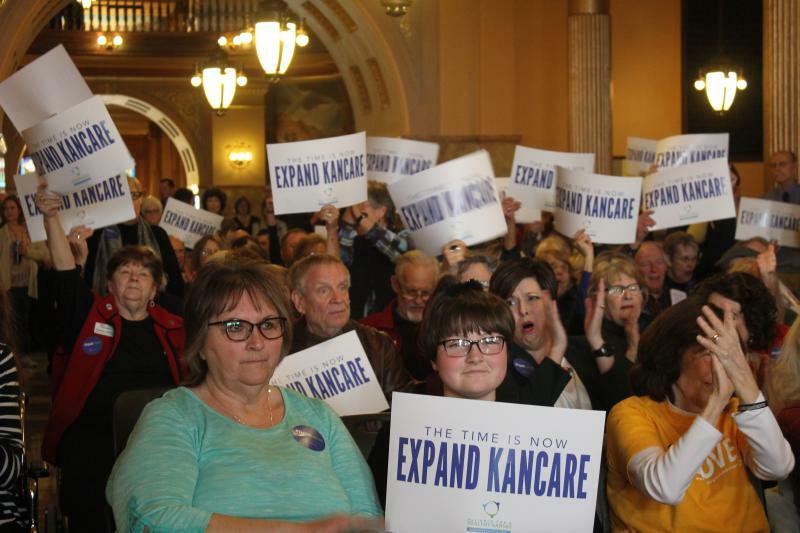 • Expand KanCare, the state’s privatized Medicaid program, to cover Kansans earning less than 138 percent of the federal poverty level — $17,236 for an individual or $35,535 for a family of four. The Kansas Health Institute estimates that 90,000 of the 130,000 Kansans expected to enroll would be non-disabled adults who are not currently eligible for KanCare. The remaining 40,000 would be children. • Require the Kansas Department of Health and Environment to refer all non-disabled adults who are unemployed or working fewer than 20 hours a week to a job training program. Parents caring for young children would be exempt. The Commonwealth Fund estimated in a 2017 report that only 11 percent of Kansans likely to enroll in expansion coverage are unemployed. Some Republicans favor a “work requirement.” But Gov. Kelly says she won’t agree to one because it would be a “nightmare” to administer. • Establish a working group to identify additional revenue sources to offset the state’s share of expansion costs. The Affordable Care Act requires the federal government to fund no less than 90 percent of expansion costs. Expansion opponents fear budget pressures will eventually force a reduction in that funding. Should that happen, an amendment added to the bill during Wednesday’s debate would require state officials to repeal expansion. The governor’s budget office estimates that the state’s share of expansion costs in the first full year would be approximately $34 million. A recent estimate by the Kansas Health Institute put the cost at $41.7 million. The lion’s share of that would come from “privilege fees” paid by the managed care organizations that administer KanCare and projected savings generated from using federal dollars to cover services and programs now funded by the state. Neither the state nor the KHI estimate include a projection of how much economic activity triggered by an infusion of nearly $1 billion in additional federal Medicaid funding would increase state revenues. New research done by economists at Kansas State University indicates the spike in revenue would be nearly enough to cover the state’s share of expansion costs. An amendment added to the bill at the urging of Rep. Troy Waymaster, the Republican chair of the House Appropriations Committee, would also help defray expansion costs by requiring beneficiaries to pay $25 a month for their coverage. Family premiums would be capped at $100 a month. Waymaster estimated the payments would generate between $26 million and $45 million a year. Assuming the expansion bill clears a final vote in the House, it would go to the Senate. Expansion advocates say they believe they have to votes to also pass it there, but the margin may be narrower. However, both Senate President Susan Wagle and Senate Majority Leader Jim Denning are opposed to it. Denning, an Overland Park Republican, has said in a recent interview he’d “be willing to have (a) conversation with the governor” about terms of expanding Medicaid. Multiple polls showing that sizeable majorities of Kansas voters favor expansion should motivate Denning, Wagle and others to seek a compromise, Kelly said. Jim McLean is the senior correspondent for the Kansas News Service, a collaboration of KCUR, Kansas Public Radio, KMUW and High Plains Public Radio covering health, education and politics. You can reach him on Twitter @jmcleanks.